Nose: A bit reserved, even secretive on the nose. With time, sweet malt arrives along with dried fruit, gooseberry, banana and pineapple. Lingering vanilla's coming through with a whiff of luscious orange. Palate: Bold and intense sweetness dominated by crisp malt and delicious dried fruit. Creamy with a touch of oak spice, white pepper and prickling tannins. Very pleasant and complex! Finish: A long, warm and sweet finish with delicate oak spice. A bit drier on the tail with nice bitter orange peel. Very pleasant and extremely mouth-coating! With water: There's more fruit on the nose with no significant change on the tongue. The finish is medium long with a slightly dry aftertaste. In summary, this is still an extremely complex dram. Comments: Another great whisky from The Whisky Chamber. Clean, fruity and very enjoyable. This one is very complex and reserved both on the nose and palate and therefore, needs a significant amount of time to reveal its secret. But its definitely worth the wait! 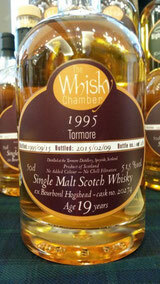 I thank Thomas Ide (owner of the German independent bottler The Whisky Chamber) for the sample. Nose: This one cannot hide its cask strength character. After getting used to the alcohol there is fruitiness, passion fruit, herbs and a hint of earthy notes, maybe leather too. Palate: Oh yes, this one hits your tongue with massive alcohol, sherry flavours and a potpourri of citrus and ripe yellow fruits. Behind this fruitiness there appears toffee, chocolate and spices from oak (no surprise after 22 years) and again herbs, maybe lavender. Finish: Good length with lingering fruitiness followed by spicy and peppery notes. With water: Oh yes, now there is more toffee and milk chocolate. Very creamy with again a spicy finish. Comments: A delicate and complex whisky that I'd prefer to drink with some water. 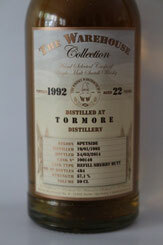 Excellent Tormore which is not overpowered by the sherry cask but still keeps its fruity distillery character. A perfectly drinkable whisky - well done!